The Best Oyster Happy Hours In Manhattan and Brooklyn. The best places where you can easily roll up and drink with a big group. Our 48 favorite places to watch sports in (almost) every neighborhood. Perfect For: Big Groups Day Drinking Happy Hour Outdoor/Patio Situation Sports! As far as we can tell, there are three scenarios in which you might already know about The Jeffrey. 1. You’re a beer geek and you live somewhere near/under the 59th Street Bridge. 2. You stumbled upon it as you were desperately trying to escape Bed Bath & Beyond, running in any direction that promised the fastest route to freedom. 3. You saw it in our 2014 Summer Guide. Otherwise, this is probably the first time you’re hearing about this little gem located under the Roosevelt Island Tram. The thing is, once you do make it into The Jeffrey, and regardless of the circumstances that brought you to it, you’ll be coming back. 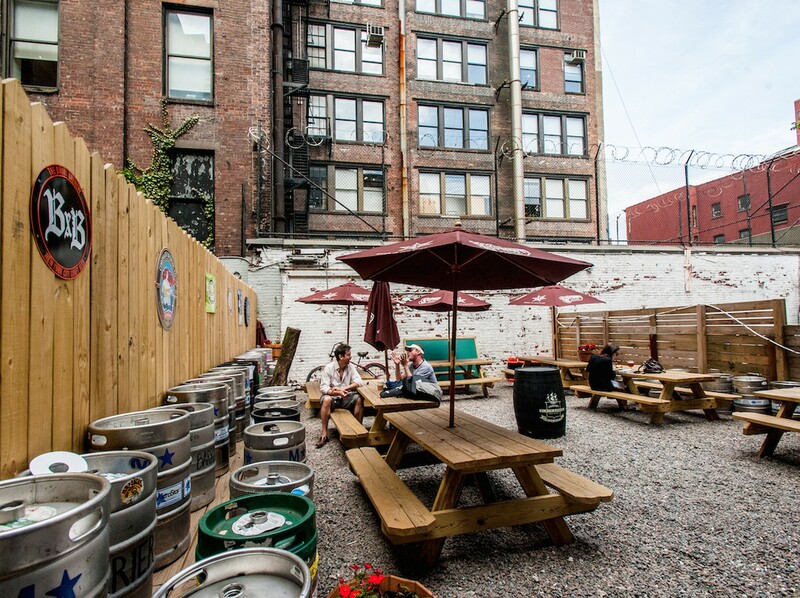 This place is easily the best bar in 20 blocks in any direction, and they also happen to have a great food menu and a big backyard beer garden. We have found ourselves visiting The Jeffrey whenever we’re in need of something Midtown or Upper East Side with outdoor seating, or when we’re looking for a spot to watch a game. The sandwiches and bar food bites are solid, the atmosphere is laid back, the beer list is huge, and the staff is friendly. I think what we like most about The Jeffrey, though, is that there’s another layer beyond all of those things I just mentioned. In addition to the beer and the beer garden and the nice TV situation, there’s also an interesting little espresso bar and cocktail “lab” on one side of the space. This area has its own separate entrance, and is presided over by a man they call “The Bearded Alchemist.” As you can probably imagine, The Bearded Alchemist is awesome, and he makes excellent drinks, often incorporating unique ingredients like homemade ginger beer and mole bitters. During the daylight hours, this section of the bar also offers high quality coffee and growlers of beer to-go. The fact that those things are even available to you in this neighborhood make The Jeffrey unique and are also a testament to the fact that it’s much more than just a beer garden - it’s an escape. Just plan your getaway wisely. They designed that Bed Bath & Beyond so that it’s nearly impossible to get out. Like a prison. With Swiffers. These are actually Sigmund’s pretzels, and if you haven’t had them before, they’re pretty great. You have three options available to you - salted, garlic and parsley, or truffle cheddar. We usually go for all three and share them. Bright red, a little bit earthy, and pretty damn tasty. Order them if you like beets and/or eggs. Bacon wrapped dates. These are sweet and salty, as they should be. Great as a snack to go with that 11% IPA you’re sipping on. A very solid reuben with an IPA mustard that has a unique flavor. You can’t go wrong with this one. We like the BLT at The Jeffrey because there’s a layer of egg salad on top of the bacon, and we’re fans of putting things we like on top of things we like. There’s usually a good selection of oysters on hand here. We had some Wellfleets on a recent visit, and they usually have a West Coast variety or two as well. An Upper East Side neighborhood Thai spot that's better than the competition. Uva is a rustic, cozy little Italian Upper East Side spot that is ideal for date night, mostly because it’s easy. Proof that Tanoshi Sushi is well worth your time? It’s on 73rd and York, and always packed. Enough said. Sushi Ishikawa is an omakase sushi restaurant on the Upper East Side where you can eat a high-end sushi meal for around $100. Reliable, delicious, and full of balls. If there's not at Meatball Shop near you already, there will be soon. This thing is about to go full Shake Shack. We had hoped that instead of conforming to Midtown, Bill’s Bar and Burger would make Midtown conform to it. It did not. The Polynesian is a tiki-themed rooftop cocktail bar in Midtown from the people behind Carbone and The Grill. Blue Ribbon Fried Chicken seems primed and ready to be reproduced and franchised all across the country. Whether that’s the actual plan or not, we have no idea. America could only be so lucky. Watch your back KFC. The Bromberg bros are coming for you. A great British pub that will help you solve all of your Upper East Side problems, or at least the ones related to food. Earl’s menu of pig and cheese heavy snacks pairs perfectly with the small but righteous selection of draft beers that they have on tap. Head up north sometime to check it out, and also visit Earl’s sister restaurant around the corner, ABV. We didn't see it coming, but we actually really dig the beer garden on the roof of Eataly. You’ll be hard pressed to find one with a larger variety of good things to eat, and the crowd is much more pleasant up here than in the tourist packed insanity that exists underneath it. If you’re looking for quick, cheap ramen on the Upper East Side, Naruto is your spot.